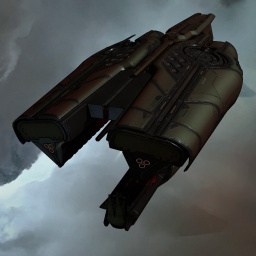 The Leshak is a precursor ship from the Triglavian Collective. It was released in the Into The Abyss expansion on May the 29th 2018, alongside its unique weapon system and two other precursor ships, the Vedmak and the Damavik. Precursor ships can fit a single Supratidal Entropic Disintegrator weapon, a DPS-ramping turret with no falloff. Their slot layouts are suited to armor tanking, and they are are bonused for remote repping, energy neutralization and smartbombing. Further information about additional or recommended skills to pilot Maelstrom for a specific or it's common role(s) can be written here. Spider-tanking with other Triglavian ships or logi can be effective, and bonuses to energy neutralizers and smartbombs make them attractive uses of the ship's utility highs. Due to the damage-ramping mechanic of Entropic Disintegrators, it is advisable to focus fire on a single target without stopping. Damage halts and the damage ramp resets if a target leaves optimal range, so range control is vital in any engagement. For those players attempting to train Precursor Battleship or Precursor Cruiser before the new prerequisites were introduced, 1 skillpoint has been granted in these skills to allow for continued training without the Prerequisite skills, akin to the Grandfathered skills method in previous releases with these kinds of skill changes. Precursor Battleship skill changed to require the newly introduced Precursor Battlecruiser at III instead of Precursor Cruiser III. Precursor Cruiser skill changed to require the newly introduced Precursor Destroyer at III instead of Precursor Frigate III. This page was last modified on 24 January 2019, at 02:45.